A couple of years ago, AIGA Honolulu reached an historic milestone as it quietly turned 25 years old. While this momentous occasion may have slipped by with little or no fanfare, many people may be surprised to know that the actual roots of our local organized graphic design community go back well over 40 years when one amazing summer, industry giants Milton Glaser, Ivan Chermayeff and Lou Dorfsman came together to Hawaii to give a series of lectures in what would later be known as Shoptalks. Shoptalk, the predecessor to the first graphic design organization in Hawaii, launched in 1979 when Carole Goodman got Milton Glaser, Ivan Chermayeff and Lou Dorfsman to come to Honolulu to visit with local designers. 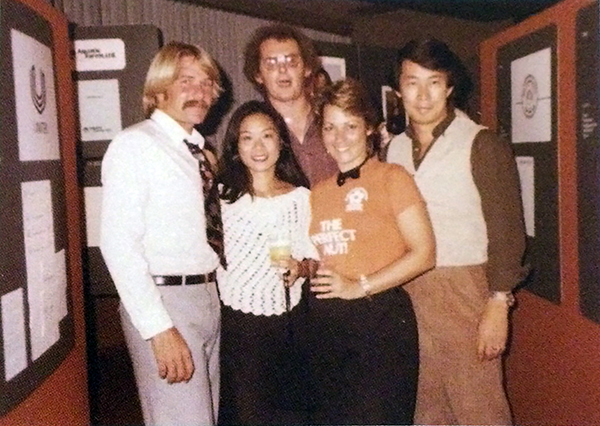 Early members of Hawaii’s GDA (Graphic Design Association) at an 1984 gallery showing of local design work. Image courtesy of Carole Goodson. Our graphic design history grows even longer – almost 60 years – if you consider its earliest beginnings, when Hawaii’s first designers started emerging on the scene with such luminaries as Tom Lee and Momi Cazimero. We felt that it was time to document and share this important story. What do we mean by documenting? We began the process over the summer, starting to outline the history of graphic design in Hawaii. We did some pre-interviews with Jan Nakamura (Synergy Design), Momi Cazimero (Graphic House), Carole Goodman (Goodson & Yu) and Clemente Legundamao (UH Manoa). 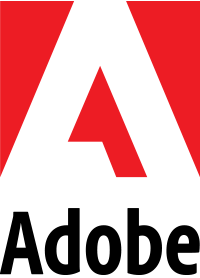 We learned that graphic design in Hawaii first became distinct from the Advertising industry when Tom Lee went out on his own to found Hawaii’s first design firm. Many regard Tom, who died tragically young, as the “father of graphic design in Hawaii.” And on the education front, professor Kenneth Kingrey brought the first design curriculum to the state from UCLA and was hugely influential to a generation of creative professionals. 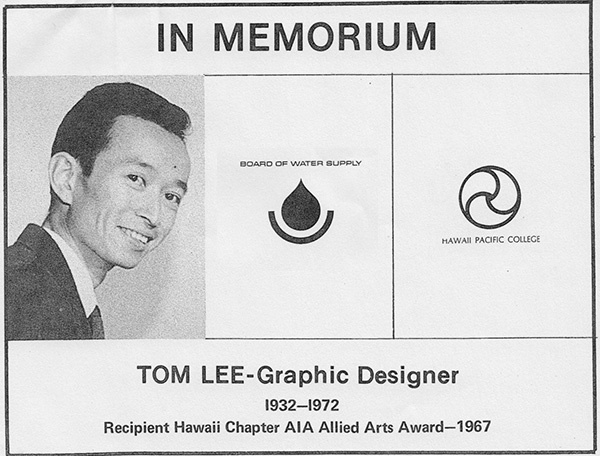 In his short career, Tom Lee was a prolific, celebrated designer. He created many long-standing logos including the Board of Water Supply and First Hawaiian Bank. Clipping courtesy of Patricia Lee. There is so much more to these stories, and so many more people to acknowledge, but we had to narrow our scope in order to have something to show at the 5-O show in October. 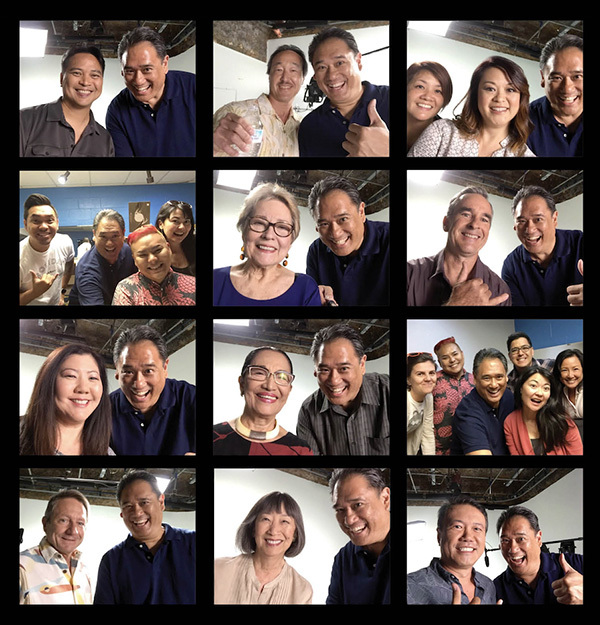 We spent an entire weekend recording video of past presidents of AIGA Honolulu, as well as with Carole Goodson (founder of Shoptalks), Elsa Carl Lee (of Clarence Lee Design), and Momi Cazimero (who counts both Tom Lee and Ken Kingrey as mentors). See the resulting short videos that were cut to be previewed at the 5-O show. 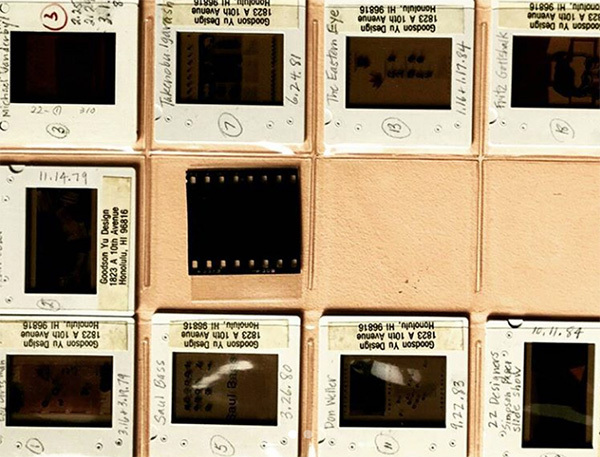 Do you have photos, documents or stories to contribute to Hawaii’s design history?